Red, White, & Blue Fun for the 4th! The annual Beaver Summer Camp 2018 4th of July Extravaganza was HOT! (And we’re not just talking about the weather!) With music and dance performances, and even a tug-of-war, there was plenty of entertainment for everyone! Emcee and Extended Day Director Max kept us laughing with his quick wit and jokes throughout the event. The event kicked off with the Beaver mascot singing the National Anthem, followed a performance of The Beaver Way with vocals and guitar by CIT Director Alan. Finally, it was time for the counselor dance-off! 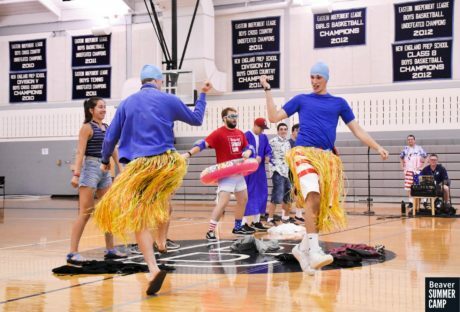 Counselor groups really brought their A-game this year, developing creative routines and including fun song selections (and even costumes)! Senior Camp opted for a fun pop medley, dancing to a variety of songs from the 80s, 90s, and 2000. Upper Camp went old-school with a routine to “Proud Mary”, while Lower Camp delivered their rendition of “Under the Sea” from the Little Mermaid. Fully decked out in swim gear, complete with water-like stage props, their perfo rmance was top notch! The last performance of the day was by the dance elective with a beautifully choreographed routine to Camila Cabello’s “Havana”. And it was (again!) 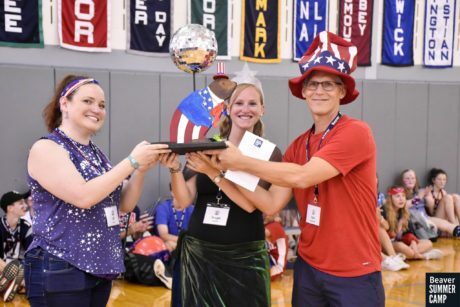 the Lower Camp counselors that took home the coveted Beaver dance-off trophy! Check out the full dance-off experience, head to our video on YouTube! To see all of the photos from the celebration, check out our album on Facebook!